This page may require cleanup to meet basic quality standards. The specific problem is: Outdated settings images as per the recent camera update. You can help by modifying the article. The discussion page may contain useful suggestions. 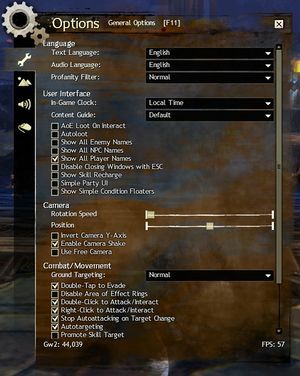 Guild Wars 2 Wiki - Official wiki for Guild Wars 2 - accessible in-game using the /wiki command. 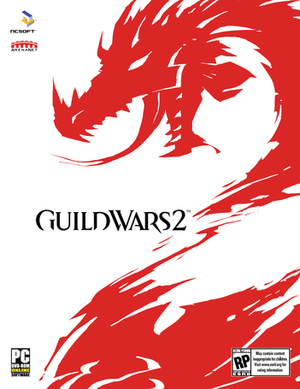 Guild Wars 2 Forums - The official Guild Wars 2 forums, hosted by Arenanet (Multiple languages available). Guild Wars 2 Guru - Fansite with a large community and active forum. Guild Wars 2 Support - Comprehensive list of error codes and fixes. The core game is free to play but free accounts have some limitations. Guild Wars 2 core game with full account (this version is included in the expansions). Heart of Thorns. Heart of Thorns Deluxe Edition also available. 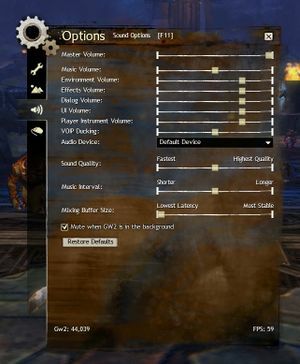 All versions require an ArenaNet Account and a constant internet connection for all game modes. For other stores Guild Wars 2 Retailers. Purchase includes the core game and an upgraded account. AMD owners have to use Flawless Widescreen. Vert- in char select, crops models. 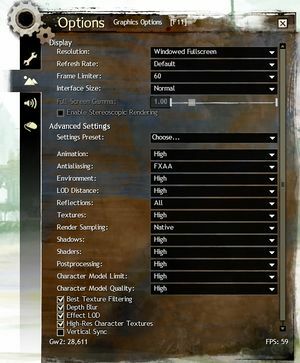 'Best Texture Filtering' toggles 16x AF; other settings can be forced in the graphics card control panel. FXAA, SMAA and SSAA available. TrSSAA, and MSAA can be utilized through the anti-aliasing compatibility bits 0x00401044 (L.A. Noire) with Antialiasing fix set to OFF under NVIDIA Inspector for NVIDIA graphics card. Has Vsync and Frame Limiter options. Master, music, environment, effects, dialog, and UI. See Helix Mod: Guild Wars 2: Heart of Thorns. Use the anti-aliasing flag 0x084012C0 with Antialiasing fix set to On. Under Profiles select Guild Wars 2. Under Antialiasing compatibility insert the flag 0x084012C0. Under Antialiasing fix select On. Under Antialiasing - Behavior Flags select None. Under Antialiasing - Mode select Override any application setting. Under Antialiasing - Setting select 2x Multisampling. Under Antialiasing - Transparency Supersampling select 2x Sparse Grid Supersampling. You may use higher anti-aliasing, if you can run it, but both antialiasing setting and antialiasing transparency supersampling must match the number of samples that are being used. Can occur with AMD graphics cards when trying to override application AA/AF settings. Open Catalyst Control Center and enter 3D Application Settings. Set anti-aliasing and anisotopic filtering to use appliation settings. RivaTuner Statistic Server causes crashes with d3d9.dll on launching the game. The error message does not mention anything other than the game crashed, but if you check event viewer it will notify you of the error. Error codes starting with 7, 42, or 58 pertain to an inability to log in. Troubleshooting steps for these errors and others can be found on this support page. These arguments can be added after the last quotation mark in the target in the properties of your Guild Wars 2 shortcut or in Launch Options if you've added the game to Steam. -StreamingClient Allows the client to stream patches in the background while in game. -autologin If client is set to remember account information, the game will login on launch. -bmp Overrides the game's default format for screenshots. -diag Creates a detailed logfile at game start at %USERPROFILE%\Documents\Guild Wars 2\NetworkDiag.log. -email <account@host.tld> Set's the log-in client's email address according to <account@host.tld>. -password <password> Enables auto-log-in if <password> is the correct password for the account. -fps <number> Renders the game at <number> frames per second. -image Forces the game to download all known updates. -mapLoadInfo Displays loading percentages and the amount of time that has passed while loading. -mce Start the client with Windows Media Center compatibility, switching the game to full screen and restarting Media Center (if available) after the client is closed. -noui Disables the user interface, producing the same effect as when one pushes Ctrl+Shift+H in-game to toggle it. -nosound Disables the audio system completely. -perf Displays performance indicators such as; Triangles, memory usage, frames per second and transfer rate in bytes per second are displayed in multi-colored text in the middle of the right side of the Guild Wars 2 window. -repair Starts the client and checks game files for errors and repairs them if needed. -useOldFov Changes the FoV back to how it was originally. -windowed Forces Guild Wars 2 to run in windowed mode. -clientport <port> Forces the game to run through a specific port, useful when your ISP is throttling certain ports and causing lag. Port 80 is recommended when using this switch. Use the Ambient Occlusion flag 0x0000002E with Quality or High Quality. Under Ambient Occlusion compatibility insert the flag 0x0000002E. These are the finalized system requirements at launch, but as with any MMO these may change over time.